InSure Vision Technologies, LLC is the leader in Surety Technology. 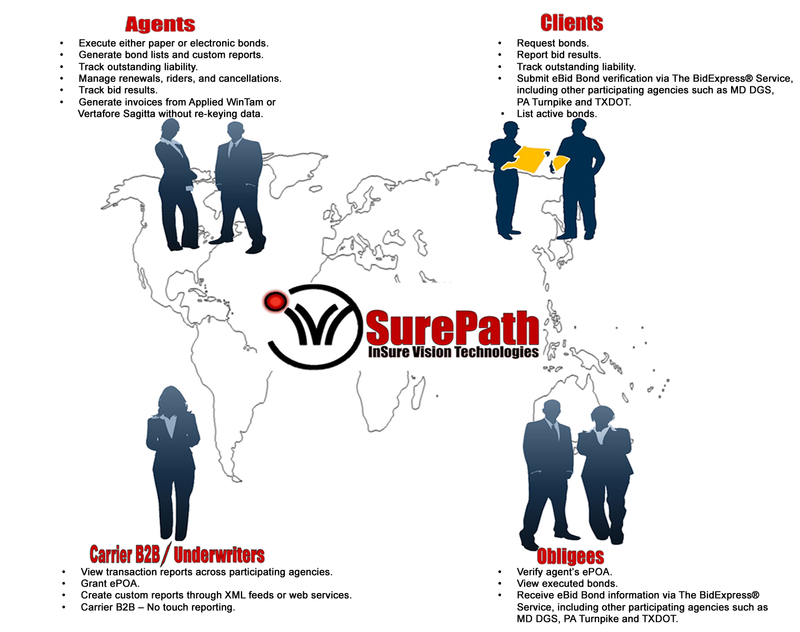 IVT is the developer of The SurePath Network, a web-based surety bond processing system. SurePath gives agents and clients an easy-to-use interface, and gives your organization the latest in Technology and interactive internet services. IVT is a Microsoft Certified Solution Provider and has extensive experience in the surety industry, insurance corporate finance and the development of insurance related systems. IVT has expertise in internet development, including the transition from paper-based processes to digitally enhanced processes. Please Browse our Menu above for additional information. You can also search on the right side of your screen. Click here if you are looking for eBonding information. Industry leading B2B ACORD Integration with Carriers - Liberty and Travelers are in production. Integration with Applied (TAM and soon to be Epic) and AMS Sagitta Agency Management System.